Wow, here’s a veritable clash of the titans to enjoy! 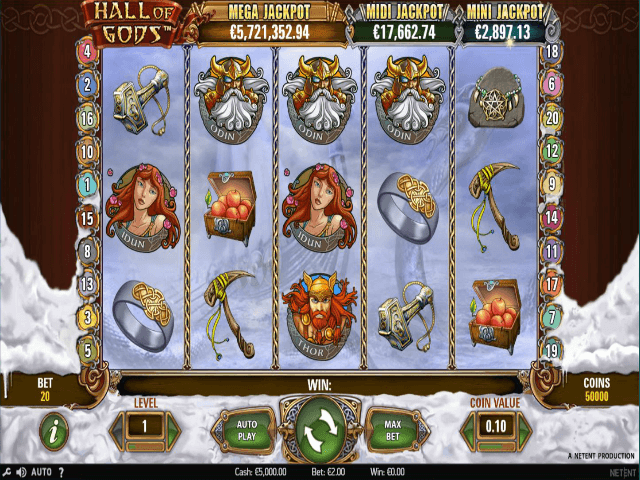 Hall of Gods online slot, a bonus-laden slot adventure from NetEnt, brings together five of the most powerful figures in Norse mythology: Thor, Odin, Freya, Loki and Idun. The results are as high impact as you might expect. 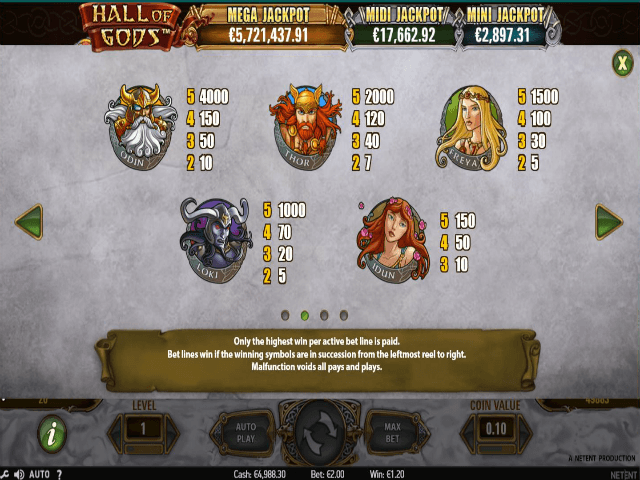 With these five powerhouses together on screen it’s perhaps no surprise to learn that the cash prizes on offer in the Hall of Gods slot game are rather mighty. There are three progressive payouts to be won for starters, as well as an outstanding collection of payouts available in the main game and courtesy of the wild and scatter symbols. Let the battle commence! 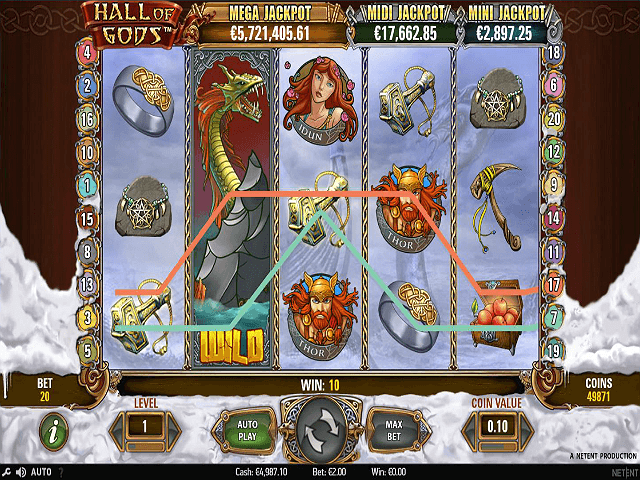 Play Hall of Gods Slot Demo for Free! Play Hall of Gods for Real Money! See, there’s nothing mythical about the size of these main game prizes! Of course, the biggest payouts available in Hall of Gods are reserved for the special symbols. The wild is the fire-breathing dragon, who substitutes for all other symbols apart from the scatter and bonus, and when appearing on reels two, three or four will expand to cover the entire reel for additional wins. Three or more of the scatter symbol (which is Odin’s pair of mysterious ravens) triggers the free spins bonus, with 10, 15 and 25 freebies available for landing three, four or five of the scatter respectively. The free spins round can be re-triggered as well. The big bounty in the Hall of Gods online slot game lies with that trio of progressive jackpots, which are activated simply by landing three or more of the bonus symbol on your reels. The chance to win the jackpot is linked to your bet size; the more you wager, the higher your chance of triggering the big bucks. That might not seem fair, but then life isn’t fair, is it? In the game there are 15 shields, and armed with Thor’s hammer you must select these in turn. Hiding behind each shield are cash amounts and Mini, Midi and Mega Jackpot icons. Match three cash sums or jackpot symbols – whichever comes first – to reveal your prize. 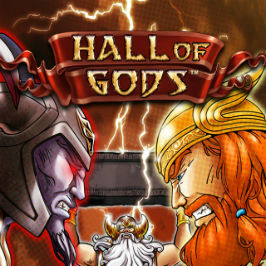 Share this Hall of Gods Review today! 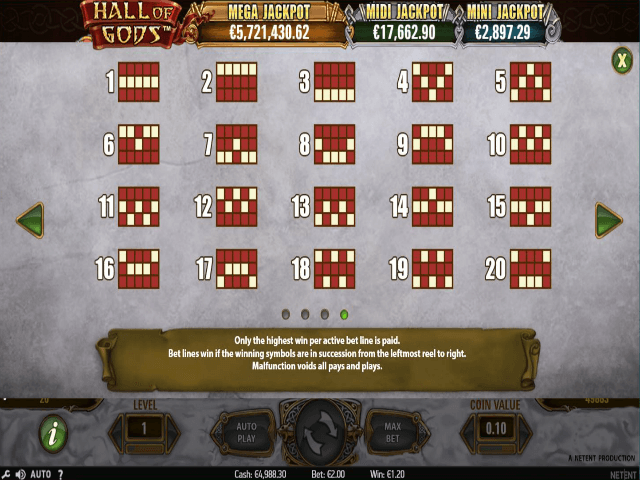 If you like Hall of Gods, you'll love these slot titles too!